Consumer behavior becomes the ultimate driver behind the evolution of the TV ecosystem. Following consumers’ habits, TV advertising shifts away from traditional TV, desktop, and mobile. New home for TV ad is CTV – connected video devices, like smart TVs, boxes, sticks, and devices streaming content via broadband. Last year CTV disrupted the way video advertising is served. How exactly will it influence this market? CTV can help make the ads more addressable, viewable, and better traceable. Also, since it’s an emerging trend, marketers who are the first to leverage CTV ad will benefit from it most. Here’s a brief overview of CTV advertising and marketing trends to watch and include in your video marketing strategy in 2019. The number of “cord-cutters”, who abandoned the use of traditional TV or never had one, is growing. So are advertising opportunities. Connected TV users in the USA numbered about 222.7m in 2017. Based on eMarketer data, AppNexus forecasts that by 2021 this number will reach 244.3m. 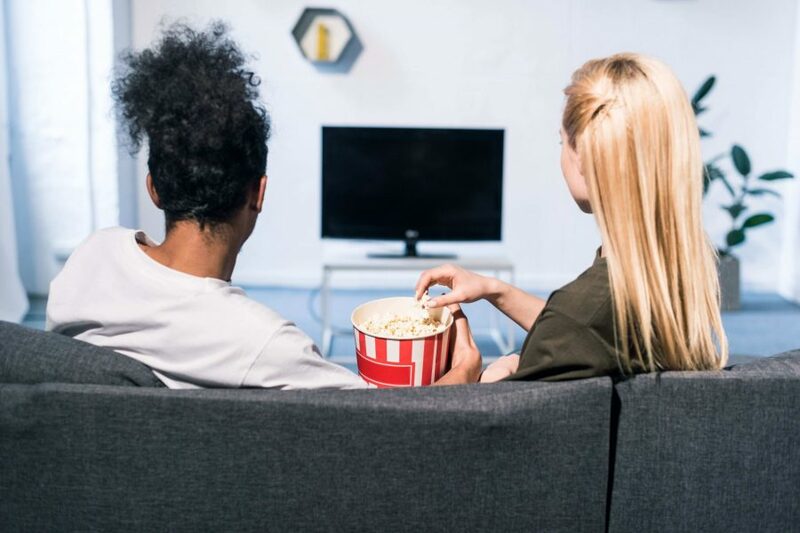 In the UK, which possesses the largest connected TV market in Europe, around ⅔ of households had a CTV device in 2018. This figure is expected to grow to by 75% by 2020. Connected TV ad allows marketers to reach a specific target audience across all their devices. Users are often active on social media when watching TV. According to YuMe research, 87% of consumers use their smartphones and tablets when watching digital content on a CTV. They mostly post about show or film on social media or look for reviews on products featured. Considering the cross-device context will help brands reach better consistency. Advertisers who have already leveraged CTV ads, keep increasing their investments in it. 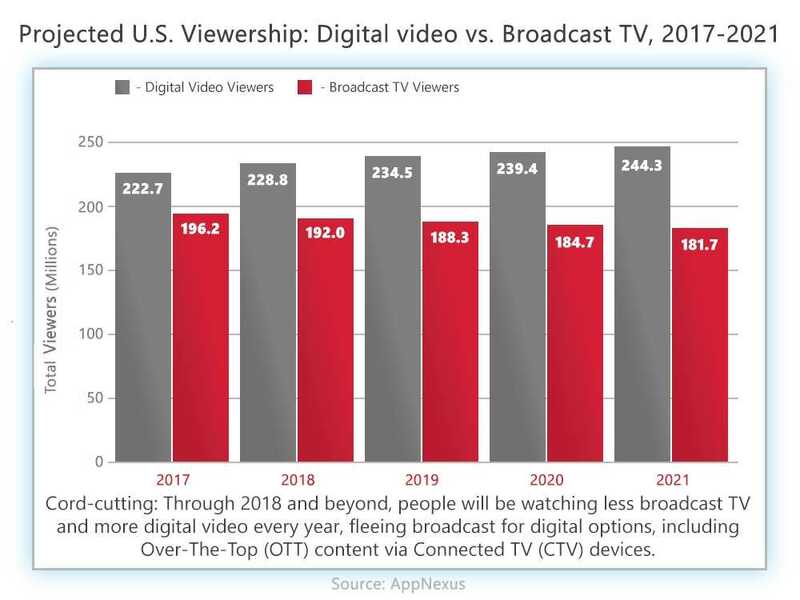 From a number of projections, 80% of marketers plan to buy inventory for connected TV devices and services in the next 12 months. 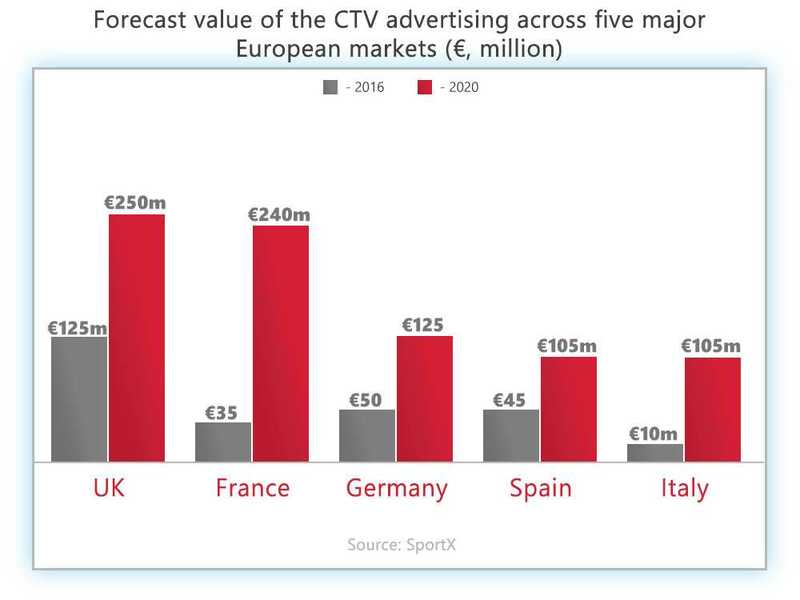 Globally, CTV ad revenues will reach $129 billion in 2023. The US remains the dominant territory in this context: revenues in the US will more than double between 2017 and 2023 to reach $48 billion. China will also become an essential player in the market. Researches forecast China will nearly triple its revenues to $26 billion. Connected TV gives consumers what they need most: access to the desired content with an opportunity to watch it where and how they prefer. 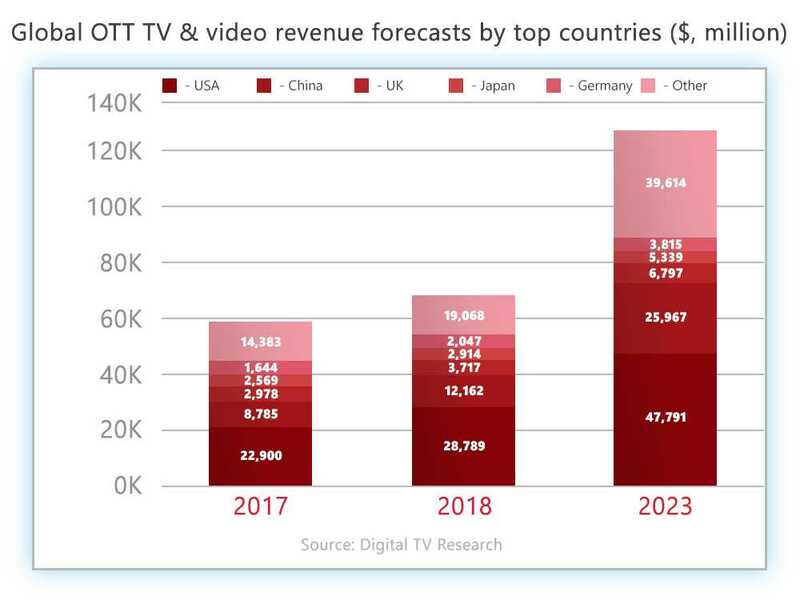 What else worth considering is CTV devices or platforms where consumers are watching content. So far, Roku is a leader for CTV ad request, serving 87% of the total in November 2018, leaving behind Amazon Fire T, LG, Samsung TV, and others. However, this can change as both Netflix and Amazon plan to launch CTV advertising space on their platforms. Now, that you know about key CTV ad insights, forecasts, and opportunities, you might think where to start. The essential factor for benefiting of CTV ad is to pick the right technology provider. Here are a few good reasons to give it a go with Admixer Technologies. Admixer provides a powerful SaaS solution – Admixer.Network intended for establishing ad networks of different formats and purposes. Using this solution you can run own network based on CTV only or supporting multiple ad formats. A great example of pure CTV ad network based on our technology is Smartoo.TV. It brings together the largest CTV applications like IVI, Megogo, Tvigle, LimeHDTV, HDVideoBOX, and others. Smartoo.TV offers advertisers the best of these applications as ads trade packages, or lets them buy ads directly from the apps. Admixer.Network allows you to target your ads campaigns by all popular CTV platforms: Roku, AppleTV, Samsung, AndroidTV, XBOX, PlayStation and more. To get most efficiency from ad campaigns, test various ad formats, including pre-roll, mid-roll, post-roll, all-roll, and pause-roll. Targeting opportunities we offer allow advertisers to maximize ads effectiveness and revenue growth. You can set up specific criteria for targeting, for instance, reach users by screens resolution. 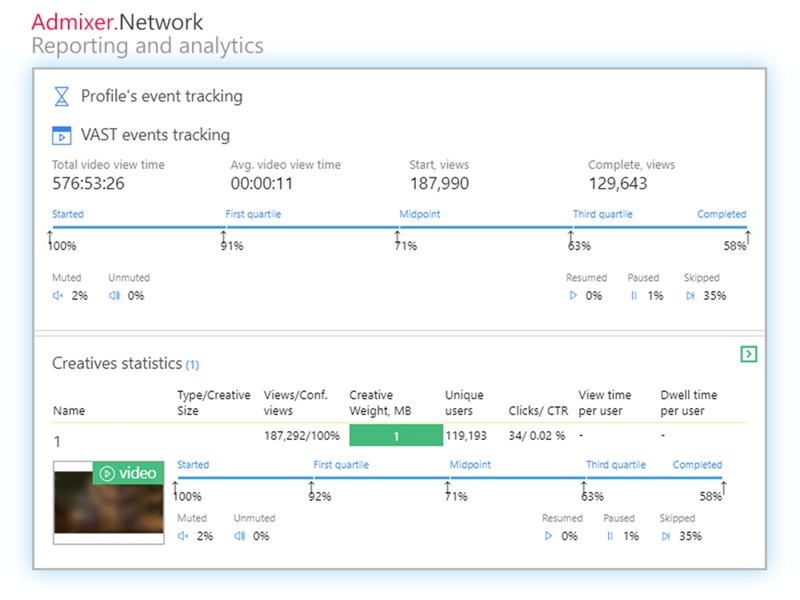 To check and track the quality you can seamlessly build-in third-party trackers into your ads campaign. CTV widescreen devices require high-resolution video creatives which apparently may be large. To store safely and get fast access to such creatives, it’s essential to have the support of a vast network of data centers. With Admixer.Network you can pick one of numerous data centers in Europe, USA, and Asia (Singapore) for storage and delivery of your creatives. 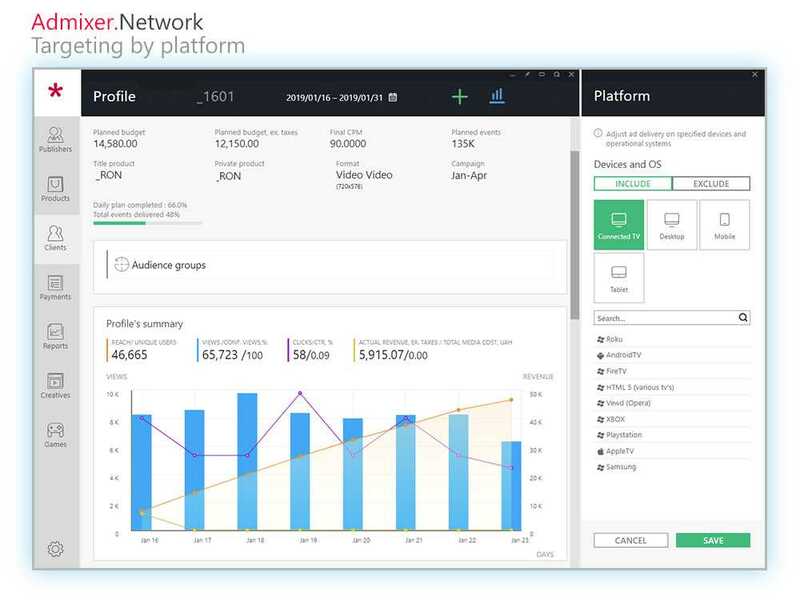 Admixer.Network powers you with detailed analytics on video creatives performance. Besides, we provide you with real-time reports and ensure lifetime data storage which you can access whenever you need. By building a CTV ad network based on Admixer SaaS products, you get an opportunity to solve most of demand issues. Just “transfer” part of inventory you can’t fully monetize to Admixer.AdExchange and get strong worldwide demand from TOP global DSPs integrated with .AdExchange. Also, you can manage CTV inventory using Admixer.Publisher AdServer. .Publisher lets you monetize your inventory both ways: through direct campaigns and via external demand, including Admixer.AdExchange sources. Otherwise, if you are an advertiser looking for high-quality inventory, leverage Admixer.TradeDesk. With .TradeDesk you get access to CTV trade packages and set targeting by social demographics data and other parameters.